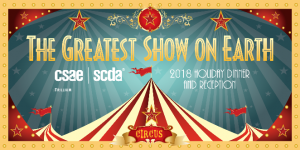 Come One…Come All to the Greatest Show of All! Do a little holiday shopping and support a good cause! Members of the Holiday Season Dinner Planning Committee will be selling mystery envelopes to support the Trillium Chapter Charity of Choice, Ontario Students Against Impaired Driving. Mystery envelopes will be sold to attendees in the amounts of $35, $70 and $100. The contents of the envelope is a mystery, but is guaranteed to be worth at least double the value paid! Please download the donations form and help us help Future Possibilities for Kids.